Mahila Vikas & Shishu Sanskar Kendra (MVSSK), Mumbai based non-profit, works with underprivileged women and children under five years’. It empowers women to become self-reliant and financially independent and provides pre-school education to kids. During FY13, MVSSK bagged a pilot project from Mumbai District AIDS Control Society (MDACS) to prevent and create awareness on HIV/AIDS. Under this project, the organisation is mandated to work with high risk groups i.e. particularly truck drivers based in two locations: Masjid Bunder & Sanpada. Getting selected as an implementing partner by MDACS has helped MVSSK earn goodwill among the community and may help its future growth. MVSSK plans to reach out to the tribal community located in Mokhada taluka of Thane district. Baseline study of the villages indicates the need for healthcare centers, sanitation & hygiene, food supply to eradicate malnutrition and education to fight poverty in the long run. 512 women have been trained in various financially rewarding disciplines since 2005. These include: tailoring, mehendi, jewelry making, etc. Empowering women by creating awareness about importance of education and financial independence. Runs Self Help Groups (SHGs) in five villages in Maharashtra. 160 women are involved in this project. Several training programmes are held to upgrade participant’s knowledge of SHGs. Offers pre-school education to approximately 40 children each year in MVSSK’s Balwadi. Teachers are trained by MVSSK and the general trend observed is that trained teachers go their respective villages and start a Balwadi in their vicinity. Reaches out to 300 truck drivers’ monthly, creating awareness on prevention of HIV/AIDs through health camps, street plays, counseling etc. 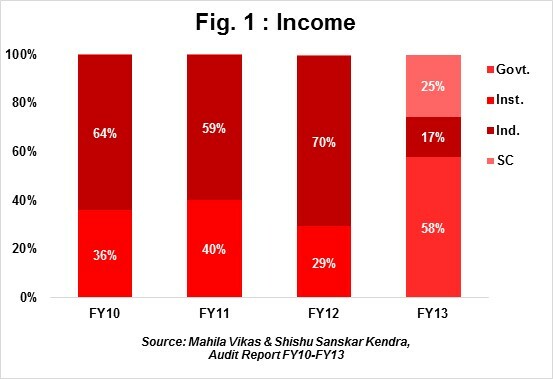 Total income shot up Y-o-Y by 436% in FY13 to Rs1.05mn. The significant Y-o-Y increase was owing to the grant received from MDACS to implement the HIV/AIDS Prevention Project. Income received from individual donors recorded 29% Y-o-Y increase in FY13. MVSSK attributes this rise to their fund raising efforts initiated while implementing HIV/AIDS Prevention Project. The strategy adopted to raise funds was through word of mouth only. Service Charges (includes application forms, pre-primary & vocational training fees) contributed 24% to MVSSK’s total income in FY13; second highest contributor to total income in FY13. 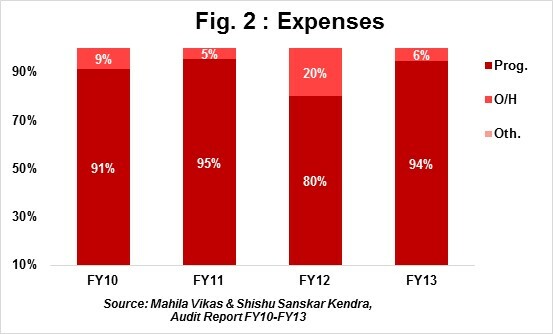 94% of total expenses in FY13 was spent on direct programme activities v/s 80% in FY12. It must be noted that only 23% of total grant received from MDACS was utilized towards HIV/AIDS project, whereas the balance portion has been temporarily channelized towards pre-school education and vocational training. MVSSK posted a 4-Year income CAGR of 95% during FY10-FY13. Had there been no government grant received in FY13, the income CAGR for same period would have been lower at 47%; indicating weak income growth without support from government sources. The growth rate appears high but its income in FY12 was less than Rs200,000, quite low after 12 years of existence. The mandate received from MDACS to implement HIV/AIDS Performance Project is for a duration of three years only i.e. FY13 – FY15. It is absolutely critical for MVSSK to raise funds from other sources to ensure longevity. Considering alternatives like approaching corporate/institutions to reach out to high risk groups in other locations for similar cause may increase the longevity of the project as well as the organisation. Self Sufficiency Ratio (SSR) has declined from 65% in FY12 to 43% in FY13; once again suggesting MVSSK’s inability to generate sufficient own income (donations, interest income, service charges etc.) to meet the annual operating expenses. Limited staff. MVSSK has a six member team, where everyone is found wearing different hats as required. The present staff lacks the right skills to promote MVSSK’s programmes. No fund raising team. With weak cash flows, MVSSK cannot afford to appoint an additional employee to take up the fund raising activities for the organisation. Board includes seven trustees. Only two trustees are actively involved in the operations of MVSSK. Board Meetings are held quarterly and minutes are circulated to all members. Has a robust process to track progress of every beneficiary across projects. Records are maintained in the physical as well as soft copy. An update is sent to MDACS on a monthly basis for the AIDS project. Induct dynamic and young individuals on board, who could help MVSSK widen the reach. Retain focus on core projects rather than introducing newer projects which are unrelated to existing projects.